For the past year, the United States Sports Academy has been working with his Holiness Abbot Shi Yongxin and the Shaolin Temple to develop a course that introduces Shaolin philosophy and history to people online across the globe. Now anyone interested in learning more about the unique and respected practices and philosophy of this ancient Chinese system can begin taking “The Philosophy of Shaolin Kung Fu” (CEB 205) continuing education course, which was made available Monday, June 13. The core text for the new course derives from the newly translated English version, “Shaolin Kung Fu Secrets,” which is from a 1,500-year-old manuscript that Abbot Shi Yongxin gave to the Academy during his visit in November 2006 to receive his honorary doctorate. By using the five books of ancient Chan teachings provided so graciously by his Holiness, who is the spiritual leader of 400 million Chan Buddhists, the Academy has developed an online format to present these important teachings on key tenets of Shaolin philosophy. Academy President and CEO Thomas P. Rosandich said that the university is indebted to the Abbot for making this cultural treasure available and for his blessings on this project. 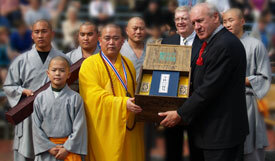 In addition, the translation of the manuscript from ancient Chinese and the development of the course was made possible by American Grandmaster Steve DeMasco of Concord, N.H.
Shaolin Today and How it Applies to You – where the Shaolin Temple and Philosophy fit into today’s global society and how understanding this philosophy and history can benefit you. After completing this course, you should have a greater understanding of the history, development, and elements that comprise the Shaolin philosophy. Also, you should be able to apply principles from the teachings to your personal and professional life. For enrollment information, contact the registrar at (251) 626-3303.